If you’re anything like most Americans, I can guarantee that you love having your sweets on a daily basis. And whether that be a candy bar, doughnut, or ice cream, you still crave something sweet. The main problem with junk food, though, is the fact that eating the stuff is incredibly addictive and can make it incredibly difficult to lose weight. Not to mention, the stuff is simply not good for you. For example, if you have one piece of chocolate cake yesterday, chances are that you’re going to crave more the following day and even more the day after that. It’s a never-ending cycle. Whenever you’re stressed out from the kids or work, these cravings can sometimes quadruple, leaving you feeling groggy, irritable and ultimately looking for a quick fix. So what do you do? You turn to food and candy like swirl lollipops for happiness or you eat out of boredom. And if your goal is to gain muscle fast, lose weight fast, and get into incredible shape – don’t even bother! Too much junk food will severely limit your ability to do all of those things. Craving junk food is something we all do, but sometimes it can get out of hand and turn from a bad habit into a terrible habit. Sure, it’s a habit you can easily break, but you must realize that it’s not going to be easy – at least not for the first couple of weeks. Breakfast is the most important meal of the day. Several studies show that those who eat breakfast tend to crave less food during the day and also weigh less. Research also shows that those who don’t eat breakfast naturally have a slower metabolism, which is bad if your goal is weight loss. So always eat breakfast. Now this doesn’t mean chowing down sugary cereal or a bagel with cream cheese. Instead, you need to be eating foods that will keep you satisfied for a long period of time – foods that are high in protein and healthy fats. Foods like eggs, sausage, bacon, fruit, whole-grain bread and milk are all great breakfast choices. Now I know that you’re probably scared because all of that food is high in saturated fat, but saturated fat was never the cause of heart disease in the first place. Don’t believe me? Check out this article on the truth about saturated fat & cholesterol. You should always brush your teeth after every meal. Not only will this give you shiny-white teeth, but chances are you won’t want to eat anything else after brushing. So to prevent you for going back into the kitchen for more, you should always brush your teeth after eating a set portion size. You should replace candy with fruit. This is a much healthier option since fruit is high in vitamins, minerals and essential antioxidants! Candy contains no nutritional value and although some candy has some fruit juice in it, candy is also high in artificial flavorings, preservatives, and a bunch of other junk that’s simply not good for you. Have a mint. Not only can mints help you concentrate, but studies show that by simply eating a mint (or chewing gum for that matter) you can reduce your urge to go after that doughnut that’s calling your name down the hall! You should always strive to get enough sleep at night. Not sleeping enough increases the production of the hormone leptin, a hormone that controls your appetite and makes you hungry if secreted in high amounts. Not only this, but leptin makes you crave one thing – carbohydrates. As you probably know, consuming a high carbohydrate will have the most negative impact on your waistline. Always make sure you’re getting at least 6 hours of sleep per night and I would recommend getting 8 hours each night. Good points, Drew! 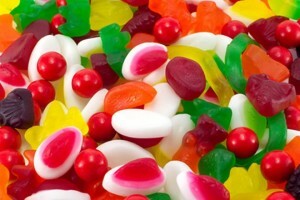 Did you know: sugar cravings can also be curbed by getting enough magnesium and chromium.